Java Controller for Sahi Pro. Value/Text: shows the value of the current element. Mostly this is the input text or the visible text. Click clicks on the identified element. Invokes the .click() API. Hilight highlights the identified element (shows a red 1 pixel border briefly). Invokes the .highlight() API. Set sets the value in "Value:" field on the identified element. Invokes the .setValue("") API. Hover does a mouse over on the element. Invokes the .mouseOver() API. Assert assert the behaviour of the system is as expected or not. Click on Append button to append the assertions to the script. 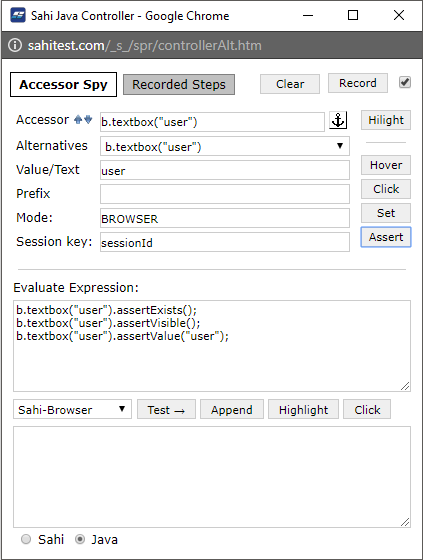 Evaluate Expression box is used to evaluate snippets of Sahi Java code. It helps while identifying elements or while debugging. Set mode for evaluate Select appropriate application mode before evaluate the expression. Test → Put a valid Sahi expression in the Evaluate Expression box and click on Test →. The result will be seen in the bottom box. 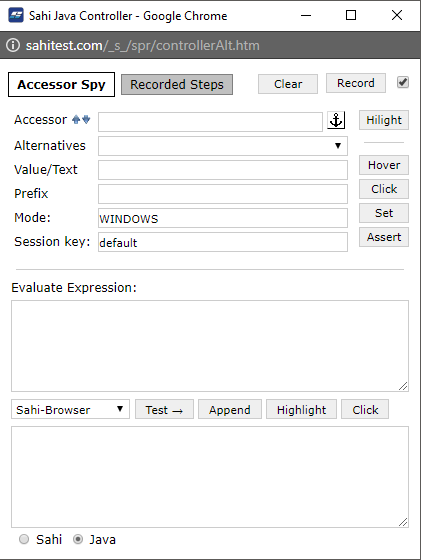 Append While recording, selecting and clicking on Append will append the steps to the currently recording script. 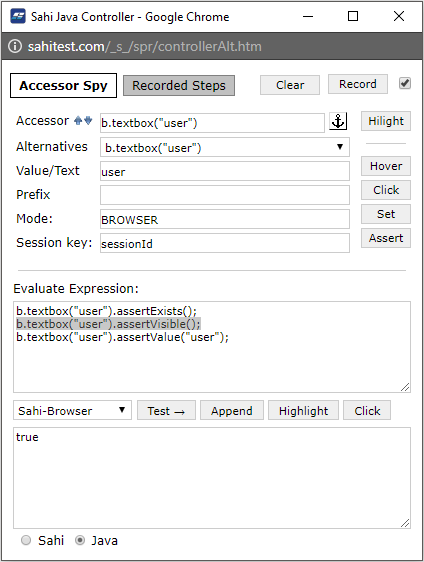 This is mainly used for manually append any step from Evaluate Expression to the currently recording script. Highlight Can be used on selected text to highlights the element (shows a red 1 pixel border briefly). Invokes the .highlight API. Click Can be used on selected text to click the element. Invokes the .click API. Click on 'Record' button and perform desired actions on the web page. 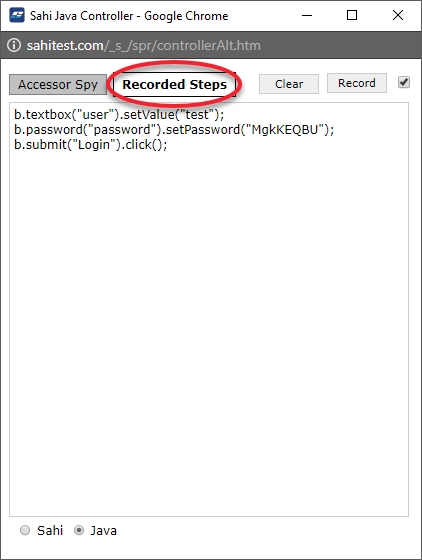 Then click on 'Recorded Steps' button and it will show all the recorded steps. 'Clear' button is used to clear all the recorded steps.